At a trade show or other industry event, every detail counts. The more you can do to promote your brand and keep your messaging consistent, the easier it will be for visitors to remember you instead of your competitors. A trade show tablecloth is just one way you can subtly distinguish yourself. Whether or not a potential customer takes outright notice of it, custom trade show tablecloths subconsciously convey professionalism and reinforce the positive, professional impression they have of you. APG Exhibits offers a number of options for any business in need of a trade show table cover. We sell products that stretch to fit tables of various shapes, as well as adjustable and draping display table covers. Follow the links on this page to view our current inventory. Can't find exactly what you're looking for? Our sales team can help. We may be able to source or custom make a trade show table cover that meets your requirements. * Note: All our table covers, all dyesub and imprint are “washable” but it is not recommended. Dry clean if needed and steam to get out wrinkles. Stretch: Tables aren't only used for demonstrations, collateral and forms. They can be an added brand message, one that creates the environment you desire. At APG, we offer a series of stretch tables that help you make the most of your event space. These tradeshow table cloths can be branded with your logo or product images, and each conveys attractiveness and professionalism. Once you choose the perfect trade show table banner, we work quickly to produce it. Adjustable: Brands that are big into events and trade shows are often dealing with a variety of spaces. Versatility is valuable, and you can achieve it through adjustable trade show table cloths from APG. 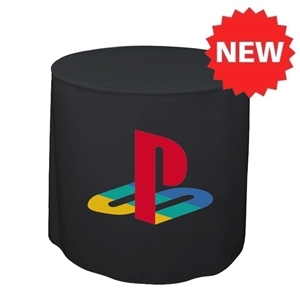 These display table skirts provide a large area on which your logo or product images can be displayed. Each features quality, attractive design and durable construction, which means you get the tradeshow table cloth you need, as well as significant return on investment. Full Color: Don't miss an opportunity to extend your brand presence through table covers for trade show displays. When you choose full color trade show tablecloths from APG exhibits, you receive an additional space on which to share images of your products, brand colors, logos and more. Trade show are crowded and competitive, so it's important to make the most of your space. When you choose full color tradeshow table covers from APG, you use every inch available in your tradeshow display. Your brand pops and comes alive with full color trade show table skirts from APG. Imprinted: Get an imprinted trade show table banner from APG, and add to your existing display. If you have banner stands or other displays, but you still rely on static, boring stock tables from the expo hall site, you can turn your display from ordinary into extraordinary by incorporating an imprinted trade show table skirt. They fold up and travel easily and offer performance over the long-term. Brand with your logo, and enjoy use for trade show season after trade show season. Runner: Get a full color trade show table runner from APG, and add to your existing display. If you have banner stands or other displays, but you still rely on static, boring stock tables from the expo hall site, you can turn your table cover from ordinary into extraordinary by incorporating an easy Table Runner. They fold up and travel easily and offer performance over the long-term. Brand with your full color logo, and enjoy use for trade show season after trade show season. Whether you want a simple trade show tablecloth with your logo printed on it or a form-fitting stretch cover that gives your booth a unique look, you can count on APG Exhibits for the best prices online. In fact, we are unique among trade show table cover suppliers in that we offer an exclusive low-price guarantee. If you find any of our products advertised for less, we'll beat the price. That way, you save money while still taking advantage of the expertise and commitment to customer service you'll only find at APG Exhibits. In over 30 years of supplying trade show table cloths, banners, pop-up displays and other promotional items, we've worked hard to deliver major agency quality at budget prices. We work exclusively with manufacturers we know and trust, and we perform all custom printing in-house, which allows us to maintain exceptionally high standards of quality control. Check out our selection of trade show table skirts, and experience the APG Exhibits difference today! Our trade show table covers can be printed in full color or imprinted with a one- or two-color logo. Whatever your branding demands, we'll make sure your design is consistent and eye-catching. With our expert design team, incorporating your logo into our trade show table covers is simple. Whether you have strict branding requirements that need to be met exactly or you'd like our help in coming up with an original design, you'll save money and time when you work with our in-house team. Plus, no one knows our products better than us we can ensure your logo has the best visual impact when printed on one of our trade show table skirts. When you're preparing for a trade show or other promotional event, your main concern should be growing your business not struggling with poor-quality marketing materials. At APG Exhibits, we take care of the details so you don't have to. Our trade show table covers deliver the highest quality at a price that won't break the bank. Simply choose the trade show table cloth you want, submit your design requirements and let us do the rest. We offer fast turnaround times on all custom work and can even process rush orders for any upcoming events. APG Exhibits is trusted by some of the world's largest companies to deliver promotional materials for trade shows that increase their ROI. Browse our online store, or contact our team today for more information! For more information about trade show tablecloths and to find out which one is best for your event and budget, call to speak with a trade show expert today at 866-752-2192, or connect with us via live chat using the widget at the bottom-right of your screen. We will also help you with additional trade show booth ideas, to help make your event a hit! Our catalog is growing constantly. If you don't see what you are looking for, please contact us. There is a good chance that exact item will be the very next item added to our catalog.